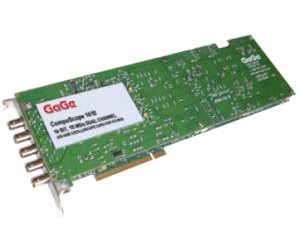 A CompuScope 1610 card for PCI bus can simultaneously sample two analog signals at speeds up to 10 MS/s with 16 bit resolution and store the data in the on-board memory. CompuScope 1610 uses state-of-the-art data conversion technology to provide dual-channel simultaneous sampling rate of 10 MS/s with 16 bit resolution. Each channel has its own ADC chip, eliminating the need for multiplexing the inputs which invariably results in increased noise and lower performance.